by Eric J. Hurwitz. Article updated on July 28, 2017. When driving down Route 495 and witnessing the Cape Cod traffic building up 30 miles out from the Bourne Bridge, a collective sigh of relief took place when taking the Route 24 exit going south to Horseneck Beach State Reservation in Dartmouth, Mass. Route 24 to Route 195 to Route 88, en route to the Massachusetts South Coast and away from Cape Cod, was virtually free of traffic congestion on this sunny summer Saturday morning. When arriving at the Horseneck Beach parking lot, we paid $8 for parking ($12 for out-of-state visitors, sorry) -- about half the price of many other area public ocean beaches -- and easily found a space in the parking lot. Why don't more people -- beyond the residents of the South Coast -- know about Horseneck Beach? Yes, the beach can get mighty crowded but the 600 acres, two mile beach allows for everyone to find a spot. 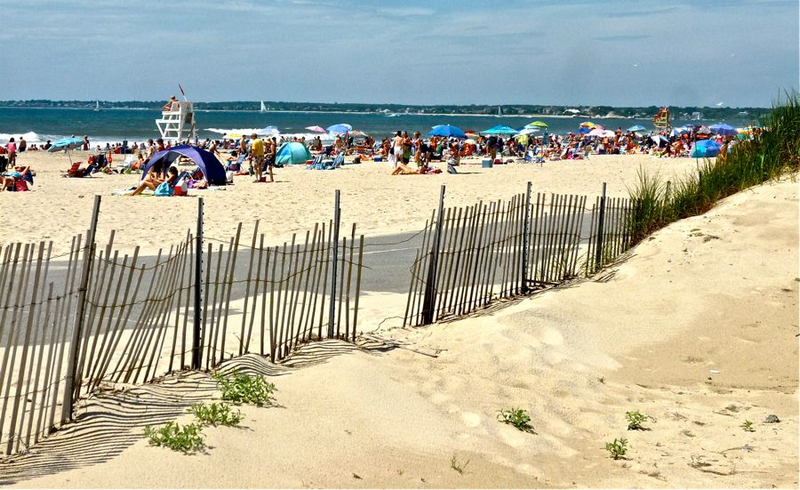 The beach is sandy, the waves with just enough kick, the dunes classic New England coastal-scenic, and the overall upkeep of this state-run beach tremendous with many lifeguards, changing areas and restrooms, and snack bars. This is a very underrated family beach beach and certainly one of the best in Massachusetts. What's more, campers can take delight in knowing there's a 100-site campground on the reservation. You can also find trails for walking and biking and opportunities to fish or go boating or windsurfing. It's a summer great day in New England when the traffic is manageable and the beach is beautiful! Horseneck Beach is located at 5 John Reed Rd., Route 88, at Westport Point in Westport MA. For more info including hours of operation and weather conditions, call (508) 636-8816.